The overexploitation of the sea coast lead us to use the sea as a possible solution. 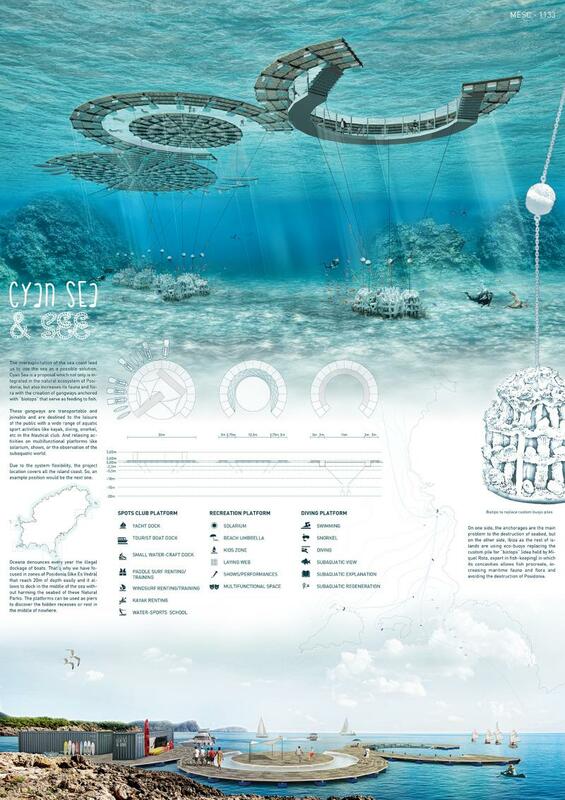 Cyan Sea is a proposal which not only is integrated in the natural ecosystem of Posidonia, but also increases its fauna and flora with the creation of gangways anchored with “biotops” that serve as feeding to fish. These gangways are transportable and joinable and are destined to the leisure of the public with a wide range of aquatic sport activities like kayak, diving, snorkel, etc in the Nautical club. And relaxing activities on multifunctional platforms like solarium, shows, or the observation of the subaquatic world. Oceana denounces every year the illegal dockage of boats. That’s why we have focused in zones of Posidonia (like Es Vedrà) that reach 20m of depth easily and it allows to dock in the middle of the sea without harming the seabed of these Natural Parks. The platforms can be used as piers to discover the hidden recesses or rest in the middle of nowhere. On one side, the anchorages are the main problem to the destruction of seabed, but on the other side, Ibiza as the rest of islands are using eco-buoys replacing the custom pile for “biotops” (idea held by Miquel Rota, expert in fish-keeping) in which its concavities allows fish procreate, increasing maritime fauna and flora and avoiding the destruction of Posidonia.